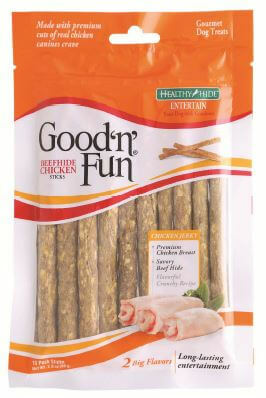 September 30, 2015 — Salix Animal Health, LLC, of Deerfield, FL, has announced it is voluntarily recalling one lot of “Good ‘n’ Fun Beefhide Chicken Sticks” because it may have the potential to be contaminated with Salmonella. Salmonella can affect animals eating the product and there is risk to humans from handling contaminated products. Healthy people infected with Salmonella should monitor themselves for some, or all, of the following symptoms: nausea, vomiting, diarrhea or bloody diarrhea, abdominal cramping and fever. No other product is affected at this time. 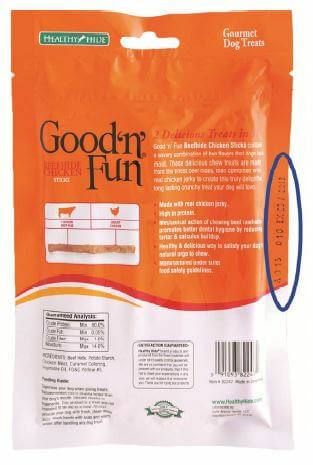 The potential for contamination was noted after routine testing by the Georgia Department of Agriculture revealed the presence of Salmonella in one 2.8 ounce package of the recalled product. 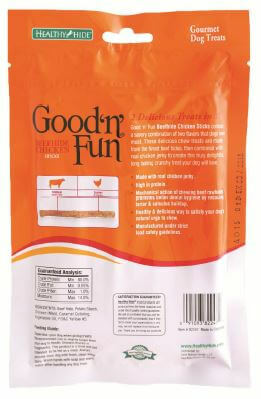 No pet or consumer illnesses from this product have been reported to date. Customers should look at the lot code and expiration date on the product package to determine if it is subject to the voluntary recall. Customers who have purchased the product subject to this recall are urged to dispose of the product or return it for full refund. The company is also working with retailers to ensure that the affected product is no longer sold and removed from inventory. If you have these products, you are invited to contact Salix Animal Health’s consumer affairs at 800-338-4896, Monday through Friday between the hours of 8:30 AM and 5:00 PM ET for a refund. Customers with questions may call the consumer affairs team at the number listed above. For press inquiries, please contact Connie Caldwell at 314-683-2460, Monday through Friday between 9:00 AM and 6:00 PM ET.